Editor’s note: Sister Joni Luna shares the story of her vocation here. She originally shared this at the recent Come and See weekend for women considering life as a Sister of Providence. I have always had a longing in my soul for something more. Growing up I always felt a deep desire to move in a direction that was counter to the expectations of the young women in my family. Sister Joni Luna created this drawing several years ago to capture her feelings on her life journey before she could put them into words herself. When I was young I was taught that if I worked hard enough I could have anything I wanted. At the time I wanted a nice house, my own bed to sleep in and a nice car. I wanted to take vacations, and of course I wanted to be able to eat out at fancy restaurants like McDonald’s. I also dreamed of going to college, a privilege that appeared only to be granted to a particular group of people that I did not belong to. I tried with all my power to leave behind who I was and enculturate myself by learning the ways of the dominant culture, a group that I saw as having the finer things in life. As much as possible, I struggled and worked tirelessly to assimilate to the values and practices of this dominant culture. I learned to speak without my Mexican accent. I entered a Catholic university even though I was not Catholic and began a pursuit of worldly riches by making as much money as possible and earning everything I felt would complete me and make me happy. On the contrary and to no avail, I found myself as lost as lost could be with all my riches. I earned bachelor’s and master’s degrees. I bought a home, two vehicles, a camper, a boat, mini bikes and kayaks. I took vacations and ate out almost every day. Imagine my surprise when I found out that McDonald’s was not considered a fine dining restaurant! I sat one day quietly on the 30-foot deck of the home I had purchased on the waters of Laguna Madre leading out to the Gulf of Mexico. And in deep and empty disbelief, I questioned, “Why after accomplishing all I worked so hard for, sitting at the pit of my being is a hollow void?” I could not imagine anything else my heart desired in terms of worldly riches. Yet, there I was empty. It was at this very moment that my spiritual quest began. I attended one church after another: Baptist, Christian, non-denominational churches. I had Mormons and Jehovah witnesses coming to my home for fellowship. I even began to attend a Catholic Church, which finally felt right. You see, my grandmother often reminded me that although my father refused to send us to church, “You are Catholic,” she would whisper. 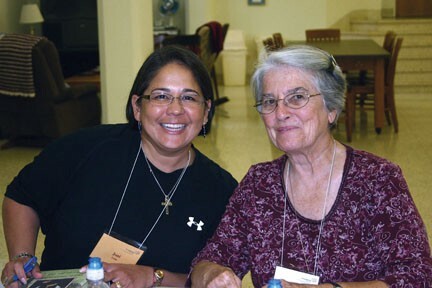 Joni Luna with Sister Barbara Bluntzer during one of Joni’s early visits to the Woods from Texas in 2010. I met a Sister of Providence by the name Sister Barbara Bluntzer. She invited me to Saint Mary-of-the-Woods. I came, fell in love with the Sisters of Providence, Saint Mother Theodore and the mission. I loved their commitment to justice, especially as it pertained to the poor, women and those on the margins. I remember thinking: “although there aren’t many Mexican-Americans in the group, they sure do go out of their way to serve us.” This spoke to me. I didn’t realize it at the time, but the void in me began to slowly fill. I came to a few Come and See weekends and began my unofficial/official discernment. I even came for an extended visit in the summer of 2011 to get a closer look at the community. I returned home after that summer with more questions than answers. Although there was a profound connection to this particular community, I was filled with doubt. Most of the sisters were much older than me. Saint Mary-of-the-Woods was 1,168 miles from my Texas home. And to top it off I didn’t see anyone like me in the whole town. How could I possibly be being called to this place? I toiled with the idea of going to Indiana. Like Jonah who ran away and refused to obey God’s call, I got angry and tried to ignore it altogether. I fought tooth and nail against the nudge in my heart. Until finally, one day, I got in my car and took off driving to nowhere in particular. I just needed to get away to clear my head and heart. As I drove and drove and drove, I finally stopped on a gravel road in the middle of the Texas desert. I stopped, got out of my car and screamed and teared up a little. After a few hours, I decided I would call Sister Jenny Howard, the vocation director at the time, and tell her I wanted to begin my official discernment. I felt I owed it to myself to at least give religious life a try and get it out of my system once and for all. 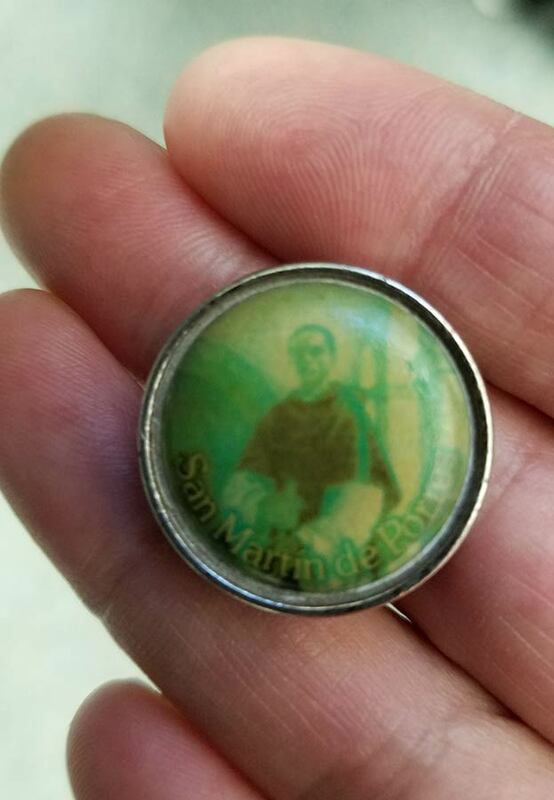 The medal of Saint Martin de Porres that Sister Joni found in the weeds. However, as Providence would have it, I was so far out of the reach of a cell phone tower my phone did not have a signal. I took it as a sign that I was not to call Sister Jenny. Perhaps I was mistaken about beginning discernment. “Very good,” I thought. I arrived home and took to pulling weeds in my front yard. Now here is where it gets a little more interesting, or providential as we like to say here. As I pulled a weed, a religious medal of a saint flipped out with one of the roots. I didn’t recognize the saint on the medal, so I took it inside and took to Google. I found San Martin de Porres. To my surprise it read patron saint of interracial marriages. It took my breath away momentarily. Wow! I thought, “Is this a sign that I was to enter the Sisters of Providence?” Going to Saint Mary-of-the-Woods would be like an interracial marriage in more ways than one. I was Mexican-American, I was younger and I was from the South. I took the medal and called Sister Jenny Howard. We made arrangements and began the official process. 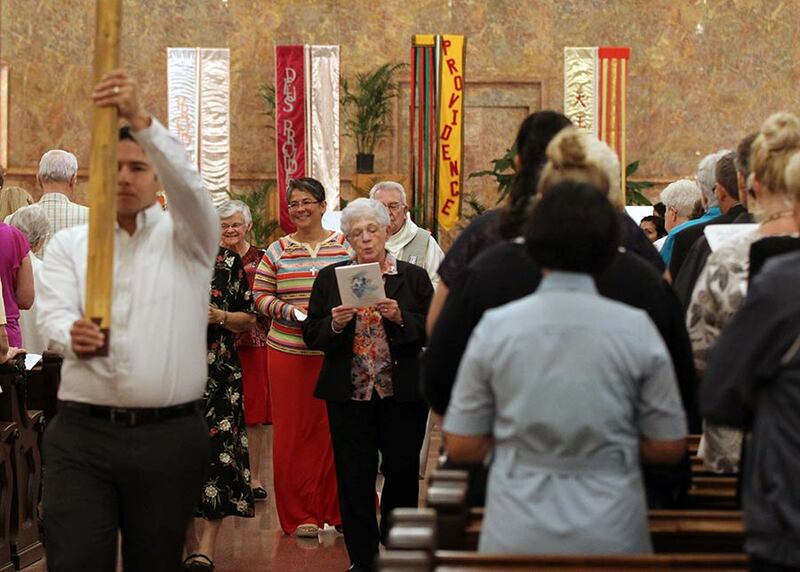 Sister Joni Luna is all smiles as she exits the church after professing her first vows as a Sister of Providence in 2016. I tell people now that if I had known then what I know now about living this life rooted in Providence, I would have joined a long time ago. This life I have chosen for myself has been a total gift. Like your life, it has its ups and downs. But I have gained a family that is rooted in God, who loves and supports me unconditionally. My sisters can often be observed encouraging me to try something new. Which, I might add, I often resist. Here are a few prayers that have sustained me during my discernment to the present, one by Sister Bernice Kuper, SP. I surrender; your will be done in me. Truth, virtue and goodness will prevail. Community and God have cracked me open to reveal the best parts of a young girl I buried long ago. Learning to accept, embrace and reveal my truest self has opened me up to love wider, feel deeper and serve with confidence in a God that I offer my whole self to each day. What a heartfelt personal story, Joni. Your discernment led you to the S.P.’s–we are enriched by your presence! Thank you. My favorite part of your journey are your grandmother whispered words, “You are Catholic”. Rooted in those three simple words is the big and consoling truth expressed by Isaiah, “Do not be afraid – I am with you. I have called you by name. I love you and you are mine”. So happy to have you as sister! Thanks for such a beautiful sharing of your journey. We are SO BLESSED by your presence among us! Thank you for sharing this beautiful account of God’s loving Providence at work in your life, Joni! Indeed all is directed by God! Inspiring vocation story, Joni. Thank you for sharing! 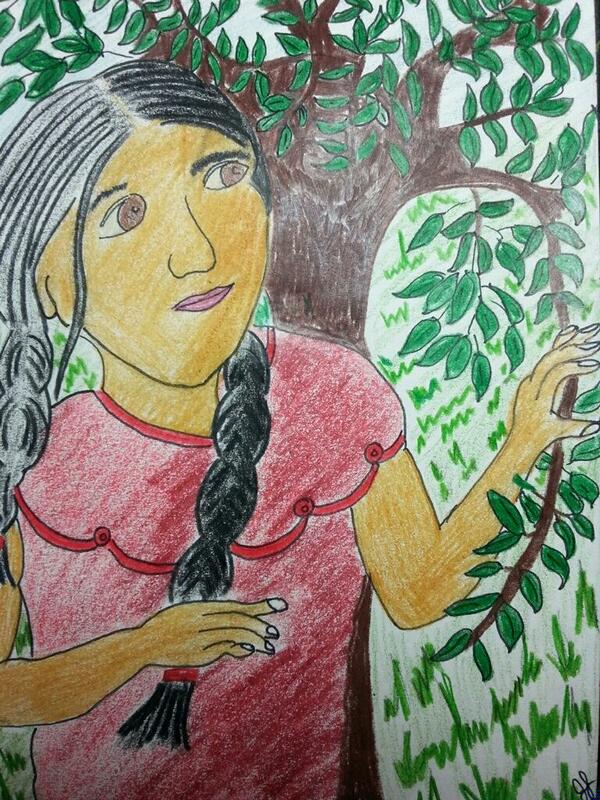 Beautiful life journey and story to become a Sister of Providence. I’m so happy for you having found happiness, family and trusting yourself to make your decision knowing you answered God’s calling. Joni, thank you for telling your story. There is so much in it that relates to those of us who entered the Congregation later in our lives. I loved it! Joni, your journey is a deep-hearted story of struggle, love and commitment. Mother Theodore would would have loved to call you sister and friend! As I have told you so often before, dear Joni. You have been gifted to see beneath the surface of appearances to the Reality of God’s love in all. Keep on keeping on. Your life shared with ours gives us the energy to be who we are called to be.